Elusive Schemer is a rare Intelligence creature card. It is part of the Core Set. 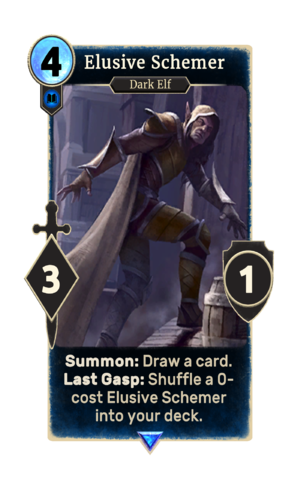 In addition to the card's availability in the Core Set, two copies are included in the Brynjolf's Heist theme deck, two copies in the Telvanni Ambition theme deck, and one copy in the Dunmer Avengers deck. "You'll not be rid of me that easily!" "Nice try! Care to go again?" "See you... in the next... world." While the 0-cost copy's cost is green, indicating a temporary buff, the copies stay at 0 cost even when destroyed. This page was last modified on 15 February 2019, at 00:14.